Infrared Scanning is a non-intrusive preventative maintenance inspection used to detect potential points of failure in your power equipment and batteries. This infrared image was obtained from the 480VAC input power to a piece of production equipment. 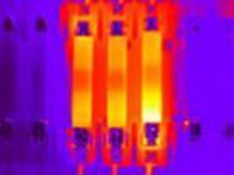 This infrared scan of batteries from a UPS system uncovers a dangerous thermal runway condition occurring.